This is the first game in the Pokémon Stadium series. For other games in the series see the Pokémon Stadium category. The first game of the series, called ポケモンスタジアム (or Pokémon Sutajiamu in Japanese, sometimes called Pokémon Stadium 0 by English Speaking fans) was released in Japan in 1998. This version featured only 42 Pokémon instead of the full 151 Pokémon from the Game Boy versions. The game uses the Transfer Pak to link to the Pokémon Red and Blue Game Boy games. This version was not released outside of Japan, and as such the numbering of subsequent Japanese releases is ahead of the U.S. releases. 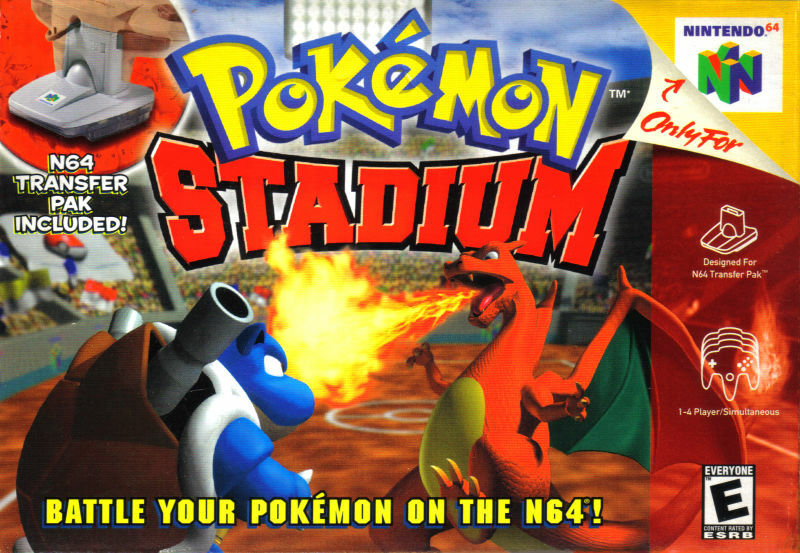 This game was originally intended for the Nintendo 64DD format, but as the 64DD was a commercial failure, Pokémon Stadium transferred to cartridge format. There was also a Pocket Monsters Stadium Expansion Disk, a proposed add-on for the 64DD but was unreleased. Pokémon Stadium (ポケモンスタジアム2 or Pokémon Sutajiamu Tsū in Japanese) was the first version released outside of Japan, and had all 151 Pokémon of the first generation. It was released in Japan in 1999 as a sequel to the 1998 game, and it was released in the U.S. in 2000. Core remakes: FireRed/LeafGreen · HeartGold/SoulSilver · Omega Ruby/Alpha Sapphire · Let's Go, Pikachu!/Let's Go, Eevee! This page was last edited on 31 May 2016, at 05:22. This page has been accessed 55,041 times.